Leading up to the event I felt something I haven’t felt in a long time, not since I was working full time and attending grad school full time – about two and a half years ago, though it feels like a decade – I was stressed out. 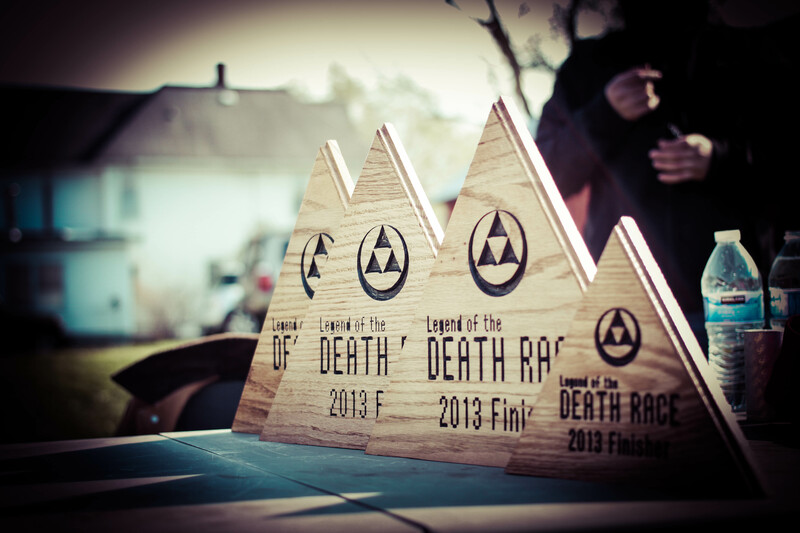 Coming back from Colorado I realized how little time was left until my second Legend of the Death Race Adventure Race, a program the started as a grass roots project to give people a simulation of what to expect at the Death Race in a shorter under 24 hour time period. Why was I so stressed though, I had everything ordered that I needed, banners arrived before I even arrived at Marxville Farm, t-shirts were picked up that Monday of the race. Everything was in place except for the marking of the course and I had already figured out at least 80% of the locations and paths – both on trail and off trail – that I would utilize weeks ago. So why after all the preparations was I so panicked? Because sometimes my passion for perfection gets the best of me. Come Thursday morning around 8:00AM I had finished marking the course and finally was able to lay down and take a nap. Only a few odds and ends needed to be finished before the race began the following evening. The fear and stress started to fade and I set to work on finalizing some of the mind games and watched a few different videos to get me motivated for my role in torturing the racers for the next 24 hours. After watching some clips from Full Metal Jacket and a other various motivational videos such as Rocky’s training in Rocky IV, I found myself ready to rest. The next 24 hours would be orchestrated chaos. It was glorious. We had 21 registrations, 12 participants showed up and only 4 would go on to finish. But I won’t go into all the details. I’ll let our female finisher, Andé Wegner tell her story. “I’m bruised, I’m battered….but I’m not broken. 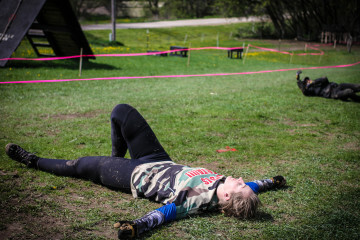 Today, I finished the most difficult race I had ever undertaken and became the first woman to ever finish Legend of the Death Race. Started around 6:30 pm Friday night. First task to fill PVC pipes with mud and water to form a slosh pipe. Chop wood and fill 2 half pallets with the kindling. Rodrigo Velarde, destroying the first bear crawl challenge. 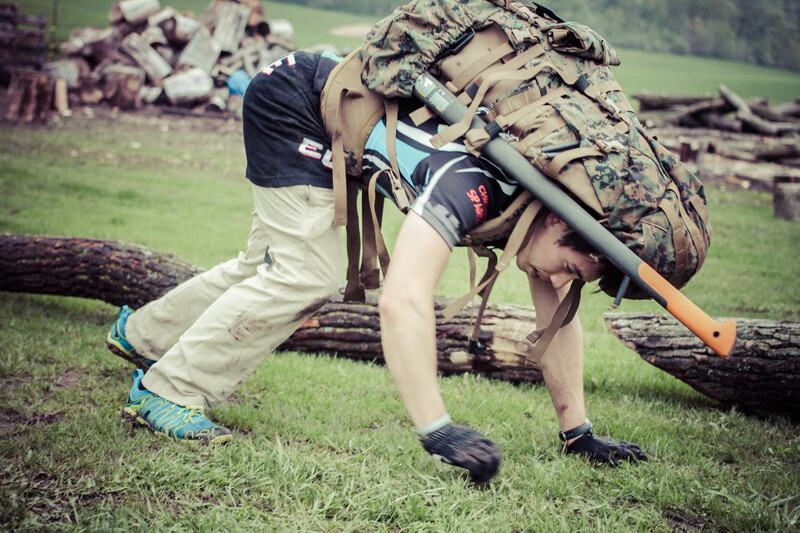 Bear crawls thru a 200 meter course in full ruck, repeat 5 times. Any swear words were punished with penalty burpees. Had to complete 500 burpees in 45 mins, as a team. We did not succeed and had to do an additional 250 burpees. Put our rucks on and headed to the trails for 9 pm, had to carry a slosh pipe for every 3 people and couldn’t allow it to touch the ground or penalty burpees would be tacked on. We had to go thru a culvert only about 3 feet in diameter and rushing with water. Tom and my third partner decided to quit after that, so Tom and I had to carry the pipe ourselves with no break – 4 miles hike total to the cub scout camp. Get to camp and have to chop kindling and start a fire. We each had to go into a room and memorize three quotes by Confucious and the word in front of it. We all sat around the fire for a bit, and everyone told their reason of why they were there. 1 hour of PT: 1 min plank followed 100 air squats, repeat a few times. Jumping Jacks for time (I think it was 5-7 minutes), 50 man makers, 1000 crunches, static squats for several mins. 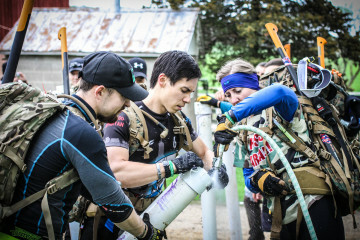 Placed with a new team and carried the slosh pipe for another 2 miles to the base of a chapel, dropped the pipe and hiked up to the chapel where we had to memorize one of three bible verses (Revelations 2:10 – “Do not be fearful of what you about to suffer,” is what I chose. Hiked back out to the base of a road and was instructed to put our sand pills totaling 50# into our buckets and carry them 1/2 mile up a steep hill, repeat 3 times, the first time holding it however you wanted, the second holding it out in front, and the third carrying it by the bucket handle. Hiked back to the chapel, and had to recite the bible verse we memorized. Correct answers got 250 burpees. Incorrect answers got extra burpees depending on how bad you screwed it up. I recited mine just fine. Hiked back to the slosh pipes and picked them up. Carried them down to the pond, then stripped down to skivvies and stood in the 40 degree water while passing the pipes over our heads. That went on for 15 mins, and we had to do squats in between breaks. We finished up there with 10 burpees in the water. Ran with our rucks back to the farm (about 2.5 miles) and proceeded to chop wood for 4 hours, filling more pallets with wood. Put our rucks back on and jogged about 1 mile to a checkpoint. We then had to bear crawl up a hill 3/4 mile and back down, rucks on. Made it back to the farm, then had to solve a puzzle box ( did mine in less than 1 minute) do jumping burpees for a total of 1 mile. Andé Wegner, our first female finisher, almost falling asleep at the log roll challenge. Final task: 6 laps around the first bear crawl course, but we had to log roll. This, above anything, is what DNF’d most of the racers. After every lap 25 tractor tire tire flips had to be done, and then the Confucious quote was dug back out – needed to name the word that was associated with the phrase. I finished around 4 pm Saturday. A big thanks to my mud brothers Dan and Ian for agreeing to undertake this challenge with me. Your presence helped me more than you’ll ever know. I’m proud of both of you for going as far as you did! Nick, John, T.J., Tom, Rodrigo, and Steve – you are all top notch people and I am proud to have raced this with you. Anthony Matesi – great job on putting together an amazing race, and I look forward to racing with you at the DR in June. This was an incredible second event and I cannot even begin to thank everyone who helped and was involved enough. Chad and Lisa are always the most incredible hosts and I cannot thank them enough for all that they do to help me organize and host the Legend of the Death Race Adventure Races. My volunteers this year were just awesome and I could not do it without you so thank you Candie, Matt, Dion and my father Rich. You all helped make the event that much better. In addition to the support from all the volunteers, I also have to thank our sponsors for their donations, Innerzyme thank you for donating the samples and prizes. ZICO donated a few cases of their delicious coconut water for to keep our athletes and volunteers hydrated. Spartan Energy provided us with the energy boost we need to get through the 20-24 hours of mayhem. I also have to make a shout out to the startup company that I’m working for LostnScanned they provided us with tags to use for our puzzle challenge. Once the puzzle boxes were opened the racers had to have me scan a LostnScanned tag to unveil their next challenge – which was the Burpee Mile – it was a pretty cool tie in and made for a neat way to dictate second to last challenge of the race. Once again we’d like to congratulate our Top Finishers, Nick Monette came out of nowhere like a silent ninja and won the whole thing, taking second was Jonathan Nolan – Founder of the Corn Fed Spartans, Tomasz Boltruczyk took third and we also had our first female finisher who gave us our recap above, Andé Wegner. 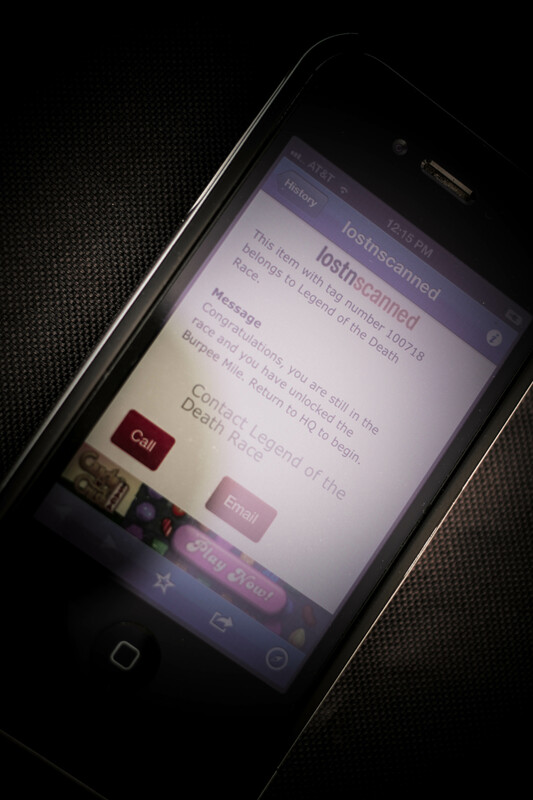 Congrats again to all of you who participated and pushed your limits. You all inspire with what you do. Keep it up and we’ll see you at the Spartan Death Race. 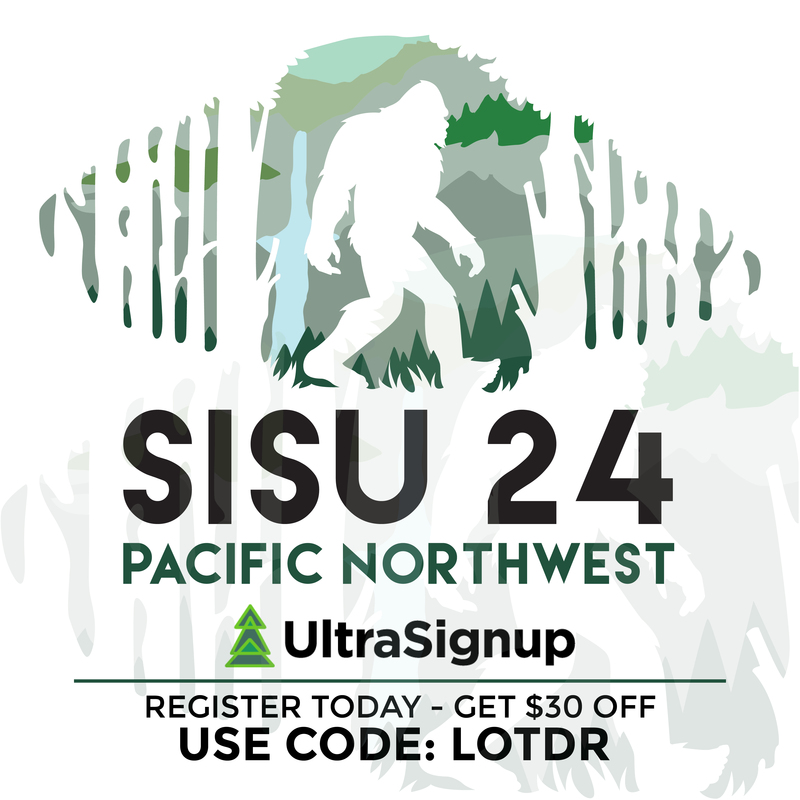 For those of you interested in the Winter Adventure Race, registration is now open. Spring 2014 Registration and new locations will be announced soon so stay tuned. awesome recap! thanks for sharing. Although I did watch that video clip with the guy screaming at the soldiers, and struggled to figure out what was so inspiring about it. Tony?